Photo Credit: Hawaii Oceanic Technology. The world’s over-fished oceans have reached maximum sustainable yield at about 90 million metric tons per year, and many fish species like tuna are facing extinction. Not only is seafood over-fished, but it is oftentimes imported and obtained through unsustainable fishing and economic practices. As a response to these statistics, Spencer and oceanographer Paul Troy set out to make the commercial fishing industry more sustainable, forming Hawaii Oceanic Technology in 2006. 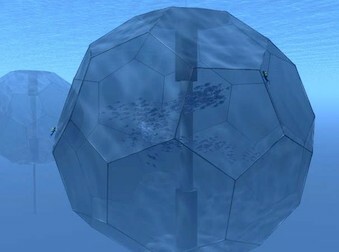 The Honolulu-based company is currently conducting research and development with its patent-pending Oceansphere, which Spencer describes as an “automated positioning submersible open ocean platform.” The Oceansphere is a 55-meter diameter free-floating geostationary platform (much like a modern oil rig) designed to be situated deep under water to reduce surface wind and wave impacts. With a fixed orbit in respect to Earth, the Oceansphere does not have to be tethered to the ocean floor, making it easy to move if need be. Spencer projects that each Oceansphere will have the capacity to produce 2,000 tons of seafood, which he feels at scale will help the commercial fishing industry sustainably meet future demands for seafood. Shortly after starting the privately funded company, Spencer began to obtain the required permits to deploy and demonstrate the Oceansphere concept in Hawaii, which is the only U.S. state that allows a company to obtain an ocean lease for mariculture. At a 250-acre lease site off of the North Kohala Coast, Hawaii Oceanic Technology currently has 12 permits for Oceanspheres, which will all use remote control, remote monitoring, automated feeding and other technologies to keep labor costs low. Spencer estimates that these Oceanspheres will produce 6,000 tons of seafood per year. “It would take 21,000 acres of land to produce a comparable amount of beef protein,” says Spencer. Using the Oceanspheres, fish farmers will be able to produce large amounts of seafood within a small footprint, which Spencer says will help achieve better economies of scale compared to other fish farming methods. The Oceanspheres can also be deployed into ocean water, further from shore and outside of bays and estuaries. Large quantities of ocean water will help mineralize waste matter, which in turn, keeps fish healthy and creates a natural environment for development.